The latest addition to the Drum Drops library of virtual drum instruments is the first to feature a newly-designed interface. 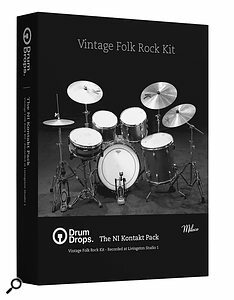 Version 2, as it’s known, has been built from the ground up by a new development partner, and will now be included with all new Drum Drops kit releases. The groove player, mixer, dynamics tools and effects sections have all survived the makeover, but now seem far more integrated and refined than in Version 1. Everything is much more colourful and realistically rendered too, not least the graphic representation of the kit, which looks great and should help users bond with the interface. In terms of processing improvements, the effects options have been bolstered quite significantly and now include two convolution reverbs with a huge list of preset options. On top of that, much work has been done to make the instrument compatible with Roland’s V-Drums and the Yamaha DTX900 electronic kits, as well as software like BFD. Drum maps for these and other products are included, but it is also very easy for drummers to build their own MIDI maps. The only significant omission is the step-sequencer tool found in later incarnations of Version 1. It seems a shame that’s it’s gone, as it was a nicely designed feature, but I have to admit that I never used it in a project. To create the instrument, producer Phill Brown recorded a 1966 Ludwig Hollywood kit fitted with Zildjian Constantinople hi-hats and a K Custom Dark crash. Only five microphones were used on the kit (including spots on kick and snare, a stereo pair and a mono overhead), and these were recorded through a set of API mic preamps. All the hit variations were played using sticks, hotrods and brushes, so that there are three fundamental sound options to choose from. As for additional percussion, a shaker and a tambourine are included. Although a few of the hat articulations have just four velocity layers, some of the other hits are made up of 22 layers or more, and almost all include five round-robin variations. There’s no denying that the basic sound of the kit (minus the built-in EQ, dynamics, tape emulation and effects) has a vintage feel. Apparently Phill chose to record in the drier-sounding room at North London’s Livingston Studios (Drum Drops’ next release, Modern Folk Rock Kit, was recorded in the studio’s livelier room), and it certainly sounds like it. The kick in particular is very dark, with a mild attack, and the snare is far from harsh. In fact all the elements of the kit are fairly easy on the ear relative to modern kit sounds. 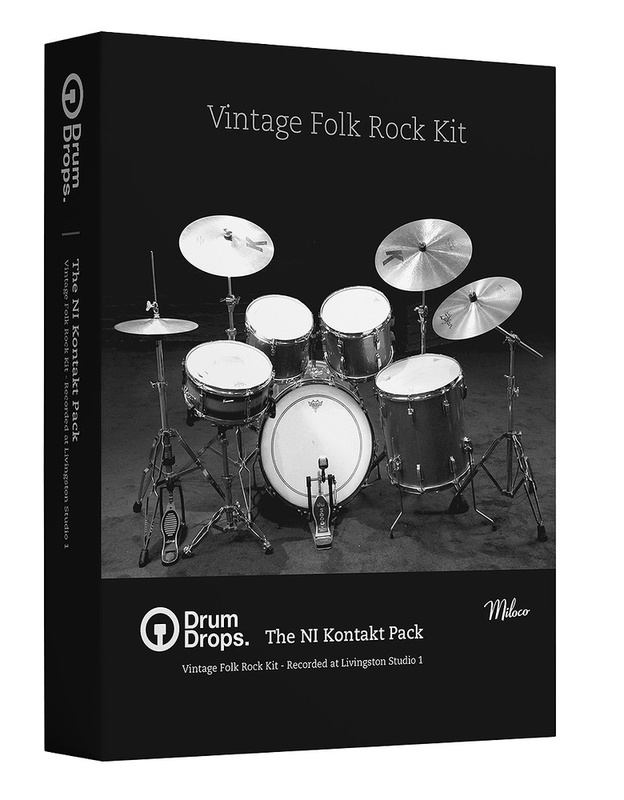 Overall, the Vintage Folk Rock kit is an impressive addition to the Drum Drops catalogue of products. It may not be the answer to every production problem, but should interest those who want to start with a dry and slightly understated vintage sound.